With the rest of the County Championship given a week’s pause from Yorkshire’s onslaught on the competition – by virtue of the White Rose not having a game – the chasing pack were given an opportunity to make up some ground, although in all likelihood, Warwickshire’s thrilling win over Durham will mean little more than a fillip in the race for second place. After last week’s big centuries, this week was more profitable for the bowlers, with impressive performances by pacemen, particularly in Division Two, as well as the inclusion of the archetypal old-fashioned swing bowler. 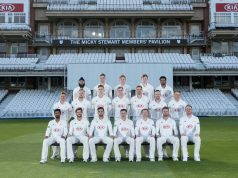 Marcus Trescothick (Somerset): Amidst the sepia-tinted allusions to that wonderful Ashes summer a decade ago, a vital member of that squad continues to go about his business in the top division of the Championship. Trescothick hit two fifties in the match, including one from 86 balls that made an unlikely victory seem briefly possible at Northwood. That high backlift, those sumptuous drives; few things recapture the essence of ‘05 like watching the Somerset opener. Nick Browne (Essex): A second consecutive appearance in the DEC Team of the Week for this 24-year-old, as Browne racked up his third century of the season. An opening partnership of 237 with Liam Dawson in the second innings proved a match winning one, as the weight of scoreboard pressure told on visiting Glamorgan. Aneurin Donald (Glamorgan): For a while, towards the end of day three, Glamorgan’s top order looked like saving an unlikely draw. Those dreams crumbled on day four, but a score of 67 from 18-year-old Aneurin Donald, including a six in just his second first-class match, has marked the Swansea-born batsman out as one to watch in the future. Rikki Clarke (Warwickshire): The most surprising statistic of the week comes from Chester-le-Street, where Rikki Clarke’s eight wickets in the match proved the best figures of his career. 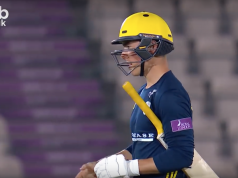 Taking the new ball for a severely depleted Warwickshire, Clarke’s wickets, and steady hand with the bat, ensured the Bears bounced back from last week’s thrashing. James Franklin (Middlesex): No wickets, and just 49 runs for the New Zealander, might not seem particularly worthy of a spot in Team of the Week, but how refreshing it was to see a captain gamble on a risky declaration that created the possibility of a decisive result; this is exactly the sort of enterprising captaincy county cricket needs- we doff our caps to him. Jesse Ryder (Essex): And so, we come to that aforementioned swing bowler. Ten wickets in the match, allied to a quick-fire 45, ensured that Essex put a sizeable dent into Glamorgan’s promotion chances. Sam Billings (Kent): Had it not been for an awful second innings batting performance, Kent might well have been toasting a victory at the Oval. A seventh-wicket partnership of 151 between Billings and Calum Haggett rescued Kent on day two; Billings fell for 99, and little went right for the men from Canterbury from then on. Gareth Batty (Surrey): As one eagle-eyed observer pointed out on Twitter, the Surrey captain is older than his new-ball partnership combined, the two Curran brothers (more on those later). Batty showed no signs of letting up in what is proving a profitable twilight to his career, with figures of 4/12 that helped dismiss Kent for a second innings total of 99. Clint McKay (Leicestershire): In the game that is still ongoing at Cheltenham, few have stood out during what has been a war of attrition so far. Clint McKay, who topped and tailed the Gloucestershire first innings to take five wickets, has left Leicestershire in with a fair chance of claiming a second victory of the season with two days still to go. Chris Rushworth (Durham): Eight wickets in the match for the paceman – five of them lbw- looked to have the beating of Warwickshire. Defeat followed, but that haul has taken Rushworth clear at the top of the wicket-taking standings in Division One. Bohannon and Croft take Lancashire to final day, but is it time to rethink day/night cricket?